What fun to find on Goodreads!! Thank you to the “Review Guru” for this awesome review!! “Now, this book offers a completely new idea. That’s how this adventure starts. The storyteller explains that he or she is trying to paint their dog but somehow things don’t work out perfectly. Class ends and the story tellers takes the picture home. Alas, a windstorm grabs a hold of it and blows the picture in a collection of art work for an art dealer. No spoilers who wins the contest and what’s going to happen from this reviewer but I’d love to share what I find outstanding about this book. Throughout the book the storyteller shares his or her opinions. Though typically, children and young people are often portrayed as “going along with everything” and “behaving properly” etc… this story teller has his or her own opinions. “… one looked at it side-ways, and one upside down! And, just like the “innocent but clever child” in the “Emperor’s New Clothes” this storyteller is sharing his or her opinions. With refreshing honesty!!! Even I who I have read thousands of books – laughed. This entry was posted in Art, Award-Winning, Behavior, Children's Picturebook, eBook, Fingerpaint, Kalpart Illustrations, Picture Book, Review, Reviews, sherrill s. Cannon, Uncategorized on September 12, 2018 by Sherrill S. Cannon. I was looking through some amazon reviews and found the following wonderful review by Laura for My Fingerpaint Masterpiece! This is such a delightful book. A young girl does a fingerpainting and doesn’t get it done. On the way home from school, the wind tears it from her hands and it ends up mixed in with some other paintings at am art dealer’s store. She’s quite surprised when she sees her painting on display at the mall. People gather around it, each with a different idea of what it portrays. I have some watercolor pictures that my son did as a little guy. They hang on the wall in my living room and many people see something different. There are even a couple where I see some different each time I look at them. When the girl tries to explain to people that it’s not a real painting, just somethings he did in art class at school, they don’t believe her. No one wanted to look silly. The book is told from the child’s perspective and it’s never explained whether it’s a boy or a girl. I guessed a girl and wrote my review as such. I like this clever idea. Boys and girls will connect with the character in their own way. A cute little story with a sweet, funny ending. The illustrations are colorful and fun. And I bet your little ones will want to dip their fingers in paint and create their own masterpiece after reading this book. I was thrilled that she captured the essence of the book in such a delightful way! Do you have an artist in your house??? This entry was posted in Award-Winning, Behavior, Children's Picturebook, Consideration for Others, Fingerpaint, Manners, Picture Book, Review, Reviews, sherrill s. Cannon, Uncategorized on June 19, 2017 by Sherrill S. Cannon. My Fingerpaint Masterpiece is Truly a Masterpiece! 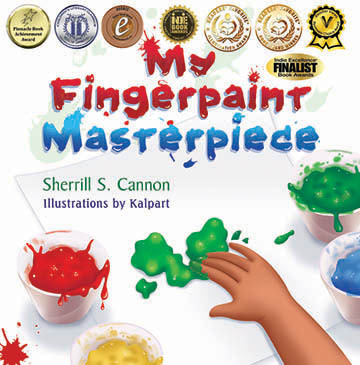 Another Holiday suggestion is My Fingerpaint Masterpiece, winner of nine awards including the Gold Medal K-3 Readers’ Favorite Award as well as a Readers’ Favorite Illustration Award. My illustrator, Kalpart, is awesome! My Fingerpaint Masterpiece deals with perspective, perception and self-esteem as a child fingerpaints artwork in class, and later discovers it as part of the town’s Art Contest. Have you ever looked at a multi-million dollar painting in a museum and thought that your kindergartener might have painted it? This is part of the theme of this book, where the illustrations are all from the point of view of the child artist, whose identity is never revealed. When giving book readings at the schools I always ask the children to vote on whether or not the child telling the story is a girl or a boy. Not surprisingly, it’s usually split 50-50, according to the voters’ gender! My Fingerpaint Masterpiece was also a double Finalist in the Next Generation Indie Awards, as well as winning a National Indie Excellence Finalist Award, a Global eBook Bronze Medal, a Reviewer’s Choice H.M., a Children’s Literary Classics Seal of Approval and a Pinnacle Achievement Award. This entry was posted in Art, Award-Winning, Children's Picturebook, Fingerpaint, Picture Book, SBPRA, Self esteem, sherrill s. Cannon, Uncategorized on December 8, 2016 by Sherrill S. Cannon. Thanks again to Miriam Ruff, of Bumbershoot, Inc., for the great 5-star review of My Fingerpaint Masterpiece! I certainly am no expert on painting, and I’m often at a loss as to what people “see” in something that looks like it was thrown together at random by someone who wasn’t really paying attention. That made this story of a young child’s art-project-turned-masterpiece very funny and quite endearing. It was also a great commentary on how puzzling the adult world can be for a child. Kudos to Cannon for telling it so beautifully from that child’s point of view. This entry was posted in Art, Award-Winning, Behavior, Children's Picturebook, eBook, Fingerpaint, Picture Book, Review, Reviews, SBPRA, Self esteem, sherrill s. Cannon, Uncategorized on June 17, 2016 by Sherrill S. Cannon.